In honor of Professor Aziz Rana‘s new book The Two Faces of American Freedom, today Cornell Law School hosted a celebration featuring remarks from Nancy Rosenblum, the Senator Joseph Clark Professor of Ethics in Politics and Government at Harvard University, William Forbath, the Lloyd M. Bentsen Chair in Law at the University of Texas at Austin School of Law, and Richard Bensel, Associate Chair and Professor in Cornell University’s Department of Government. The book is also being featured at the Law Library circulation desk in the Reading Room. 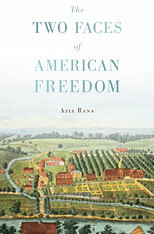 Professor Rana’s book, which grew out of his dissertation work at Harvard, argues that in the United States, freedom and exclusion were not competing values, but part of the same ideological system. Those in power maintained their economic and social freedom by denying those same freedoms to others (e.g., Indians and African Americans). This practice continues today; interest groups (for example, the Tea Party movement and labor unions) advocate for policies to protect their economic well-being and against policies that will extend privileges and benefits to others, fearing their own economic and political positions will diminish. The book’s concluding argument is that political change and the preservation and extension of freedom has continuously been the result of groups of people, most often the marginalized, unifying their voices in support of freedom. For these and other insights, presented in beautifully written prose, take a look at the book.